I realize that pickles are available in plentiful quantities in the grocery store. I realize that pickles are available in everything from cheaply made with the nastiest ingredients, to gourmet pickles with all-natural ingredients. And I know this because for years now, absolutely years, ever since the allergist at the hospital said “hmmm, look how this garlic patch is flaring” and diagnosed the reason behind my then-frequent migraines….since that moment, pickles have taunted me from every grocery store aisle. Every single pickle brand I’ve looked at (and believe me, I’ve looked at them all!) has either garlic, or “spices and natural flavours”. The latter generally means either MSG / MSG derivatives, or a proprietary spice blend that they will neither confirm or deny the presence of garlic in. If you’ve ever seen a woman standing in the pickle aisle, on her cell phone to a pickle company, saying “I don’t care what mysterious secrets “spice” means…does it have garlic?!? !”…that would be me. I love tangy crunchy dill pickles – as a side dish or layered on sandwiches or even just when I’m craving dill. And yes, I’m aware that one can make pickles at home. I live in a rural area, where pickled things of many varieties are a staple, and many women have carefully hoarded pickle recipes that I’ve been led to believe involve days and nights in front of a stove, mysterious incantations, and exotic seasonings harvested under a full moon right before the first frost. That, plus the fact that when a pickle craving hits I simply don’t have time to stop and go buy ingredients and can All The Things, has kept me in a sad state between “I should learn to make pickles but it’s midnight and the stores are closed” and “I should learn to make pickles but I have deadlines at work and by the time I cook supper and get everything ready to cook pickles all I’ll really want to do is collapse in the chair and knit”. So…I have remained without dill pickles for many years now. Until last night, when my friend Heather posted this pickle recipe on Facebook. 4 ingredients! FOUR ingredients, none of which involved harvesting in any ritualistic fashion. FOUR ingredients, which I immediately went to the store for, only to find that in this tiny town, fresh dill isn’t available. However, the kindly clerk informed me that yes, dried dill would work, so I came home with 3 English cucumbers, white vinegar, dried dill, and kosher salt. At 11:45 last night, I began my pickle-making attempt. First, I sliced the cukes – opting for 1.5, as that looked about right. 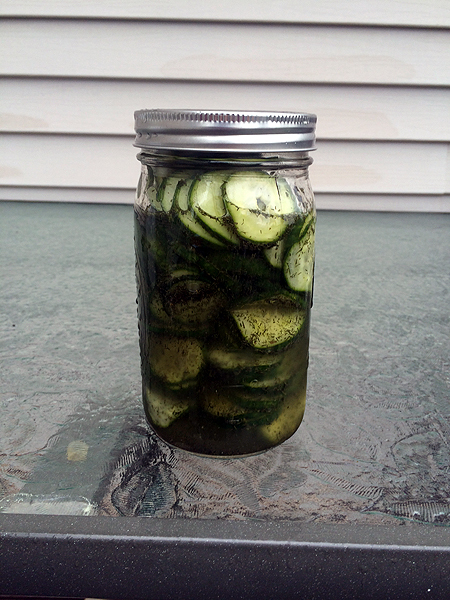 I was too tired (read, lazy) to go dig up a canning jar and wash it, and the comments said that using a freezer bag would work and allow the liquid to easily reach all slices, so I grabbed a gallon freezer bag and dumped the cukes in. Then I added the vinegar, the kosher salt, and double-checked the recipe. Hmmm, 1-2 tbsp. fresh dill, I love dill…so I went with two generous tbsp. of dill. Those of you who have more dill experience than I will spot my novice mistake, one I realized the moment I sealed and shook the bag. That’s a LOT of dill. Like, green paste gooping over my carefully sliced cukes. One quick Google later, I realized that yes, dried dill is much more potent, and so I rinsed the cukes and started over, this time with a scant 1 tbsp. of dried dill. I shook the mixture, laid it out flat to pickle in my fridge, and tried to go to bed. I couldn’t sleep (hello insomnia, my old friend) so about an hour later, I shook the freezer bag again, then finally fell asleep. With that charming vote of confidence, I took a bite. Crispy, dill-flavoured, tangy…followed by a kick of “Oh holy cow this tastes like I swallowed a bucket of vinegar!! !” Given that it had been so many years since I’d tried a dill pickle, though, I thought perhaps I’d misremembered and all pickles were supposed to be that tangy, so I talked my son into trying one, earning me the Mean Mom of the Day award. He said “Mmmm, these are good oh crap why are they so sour ouch ouch ouch yuck!” – so apparently, I hadn’t misremembered and pickles are indeed not supposed to turn your mouth inside out. 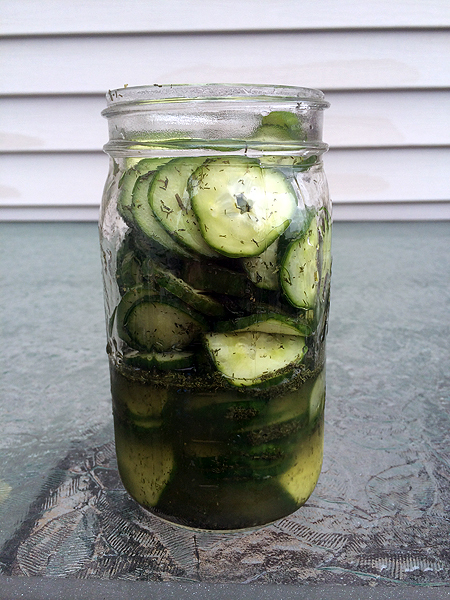 Here’s what they looked like – I found and cleaned a canning jar, and dumped them in, just in case I’d gauged the amount of cukes or liquid wrong from the recipe. See that liquid? In spite of the recipe promising me that the salt would drain the liquid from the cukes and make adequate amounts…that wasn’t my experience. Now, I’m willing to concede that I used English cukes and not Kirbys (again, small town grocery store) and that I used a freezer bag when her original recommendation was a jar. However, I’m not sure either of those facts accounts for the tongue-searing tartness I experienced. I wasn’t willing to give up on my quest for enjoying a dill pickle, though, since it was *almost* within my grasp. So I held a slice under the faucet for a moment, then tried it – and it was so so yummy! And that is why I then decided to add spring water to my jar of pickles, and shake it. I have no idea what this will do to the pickles long term, and it’s probably going to turn them mushy or make them grow things…or it would, if they lasted long enough. I suspect that by the time I’m done snacking on them for lunch along with an egg salad sandwich, and using them in homemade tartar sauce for tonight’s fish poboys, and munching on them tomorrow as I knit, and finding The Boy digging into them at frequent intervals, that I don’t have to worry about them turning bad.